‘Where are you from?’ – It’s how all the conversations begin here in Jordan. Usually followed up with something like, ‘Ah! Korea! Korea good! Samsung good!’ or ‘Are you married? Have a boyfriend?’. It’s a question of which the content of the answer has no significance at all. I might as well be a Venezuelan or a Congolese and the conversation would still have gone in the same direction – apart from today. ‘안녕하세요, 저는 한국말 공부합니다 (Hello, I am studying Korean)’, slowly but flawlessly he speaks to me. A big smile floods my face and I become animated, bombarding him with questions after questions. Where does he learn Korean? Why? How long? The restaurant is a family run business and he was one of the owner’s nephew, and I am suddenly treated like their family friend. ‘Come inside! Come! Come!’ I am ushered into a room inside the restaurant, and takes only 1 JD for the sandwich I ordered. I tell him I want to buy a bottle of water, and he gives it to me for free. Another man in the restaurant gives me a CD that has photos of key sites in Jordan as a present and a bottle of coke is on the house. 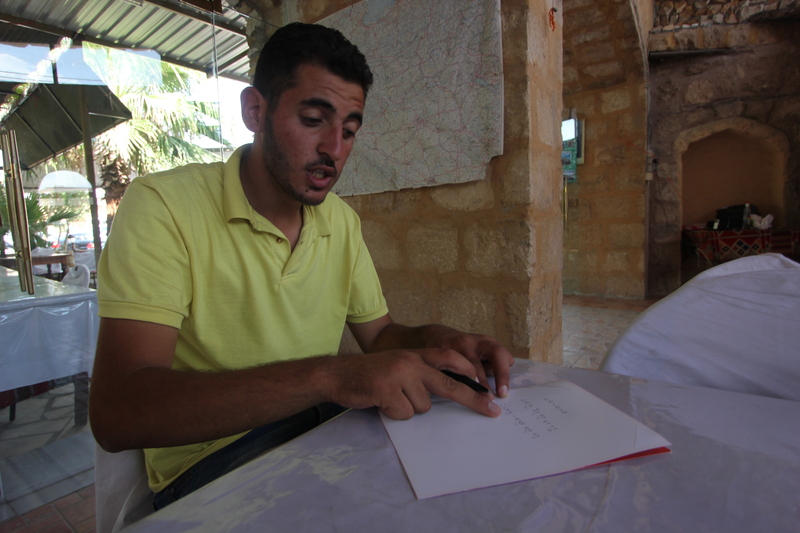 ‘How can I get to Ajloun and Mar Elias?’ It is Friday so I have to rule out public transport. The man at the restaurant makes a couple of calls, asks around people around him and eventually leads me to a table at the back of the restaurant an Asian man and his Jordanian driver are having lunch. ‘They are going back to Amman today so maybe you guys could travel together and share the costs’. This is how I met Masato, a very easy going, mischievous Japanese man who also happen to speak Korean fluently. We are soon listing Korean/Japanese music bands and TV programmes we both know, and bam! We’re now friends travelling together. He was happy to visit the Ajloun castle and even come along to the Mar Elias, which is a site visited by Christians and Muslims. We fill the rest of the afternoon being typical Asians – clicking away with our DSLRs, triumphantly holding out our ‘V’s with our fingers at each photos, and of course, singing PSY’s Gangnam Style in the car. Thank you Jen! How long were you in Jordan for?